I am not a classical music lover, but occasionally when I want to evoke an emotion then I will put something classical on. 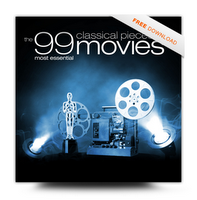 But I will be definitely be claiming this freebie for 99 free classical pieces from movies. MoviesX5 is giving away the downloads for free and this is one of the best music freebies we have had in a while. All you need to do is to submit your email address then they will email you back with the download link. There have been loads of musical scores and pieces that have made it big after being featured in the movies, like who can forget Strauss’ “Also Sprach Zarathustra” in the sunrise scene in “2001: A Space Odyssey”?